Located between RAVELLO & AMALFI, in the beautiful ancient hamlet of PONTONE ideal for trekking lovers and appreciated for its tranquility. Amalfi, Ravello, Positano, Capri, Pompeii & Naples are easy to reach. + A CASH deposit of 250 Euro is requested on arrival and refundable on departure. The separated bathroom offers a large shower with toilet, sink & bidet. The en-suite bathroom offers a large shower, toilet and sink. 3 days stay without additional charge. Cash deposit requested on arrival 250 Eur .and refundable on departure We have a great organic garden and we produce our lemons, vegetables and a delicious extra virgin olive oil. Amalfica, vamos a regresar pronto. Cute with a great view! Berengere was a great host who provided a very cute and comfortable place. We stayes 3 nights while on the Almafi coast. Prior to our first visit to this coast. We were able to ask her several questions and she responded quickly. She also provides you with plenty of recommendation and great information about anything she knows ( hikes, water falls, capri, positano, ferries, ect...). Please keep in mind that everything runs small in Italy so if your looking for a house it's going to be hard to find. You will mostly find flats and hotels for rent. To be honest if your spending a lot of time couped up in your flat than your missing out. The only time we spent in this flat was to shower and sleep. Thanks again Berengere! Beautiful, clean, and updated apartment. Conveniently located in a quaint village. Great hiking. Myself and three other guests had a wonderful time in this apartment for two nights. The location was perfect for checking out Pontone, Amalfi and Ravello-all within hiking distance. The owner was amazing to work with - helping arrange transportation, info on hikes, and very quick to answer all questions via email or text. We would stay again and will recommend for friends. Lemon in the Air is a jewel! Very clean and comfortable, the flat is wonderful in every way. Berengere could not have been more gracious or welcoming. She met us the minute we stepped off the bus, escorted us to Lemon in the Air, and poured us a cold glass of lemonade. She was more than happy to answer every question and even suggested the best itinerary for our stay in Pontone. We stayed with another couple and would highly recommend this beautiful apartment in the quaint village situated near Ravello, Amalfi and the other Amalfi Coast towns. We hope to return some day! 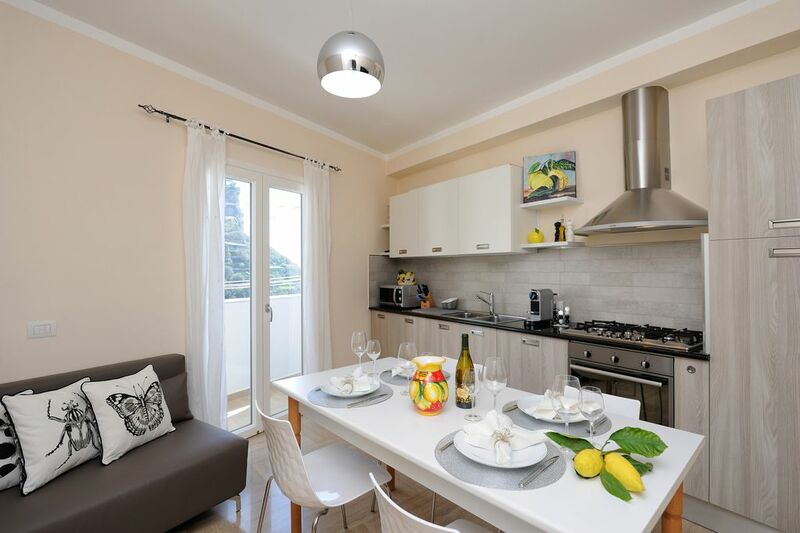 Set in the hills above Amalfi and a few twisty mountain miles below the scenic town of Ravello, the “Lemon in the air” apartment in the charming hamlet of Pontone was the perfect place to cap our two week holiday in Italy. The accommodations were superb and beautifully furnished, including a spacious kitchen fully equipped with new appliances, and two bedrooms with comfortable beds where we (my wife and I, and our adult son) were able to sleep peacefully after our day of trekking up and down the steps and paths of the Amalfi Coast. But the crème de la crème was our sweet and wonderful hostess, Berengere. She and her family live across the street so that she was always available to give suggestions for things to do and tips about how best to get around. Berengere was always friendly, always smiling, always ready to offer assistance. And yes, there was also the fresh lemonade she greeted us with on our arrival, the scrumptious figs picked from her garden, and, of course, her homemade Limoncello. As I said at the beginning of this review, it was perfect. Fantastic! The property was exceptional with every possible need met. Very clean, beautiful. The property was exceptional. Beautiful property high in the mountains. Great experience. The property was very clean and modern, all our needs met and then some. We didn’t need or want for anything. Our host Berengere took very good care of us, very friendly and there to help with great hospitality, imaculate property high in the mountains. The apartment is located in the beautiful village of Pontone, between Amalfi & Ravello, easy reachable by foot (25 min walking distance) offering spectacular views and walks through lemon groves. Positano is located at 23 kilometers away. The apartment has very easy access, NO STAIRS Which is not common for the Amalfi Coast. Private parking is available on request. Private open parking ON REQUEST with private access, located 80 meters away.